He gave out a Reservation Request form and a pen to fill it. I wrote down my details and returned it. The system acted up, and he had to re-log in to the system. I was still quite confused and worried - will I make it? Sometime later, the guy was successful, and he managed to reach the seat selection section. I asked for a window seat - and he booked one. He repeated the details to me - "November 20, Sunday. Shivneri. Morning 10am from Dadar, going to Pune, via Aundh. Vashi pickup. Seat number 16". That was correct. "Rupees 396". I pulled out a now-demonetised Rs. 500 currency note. He asked, "change nahi hai kya" (Don't you have change?). I said no - I had all of Rs. 200 with me. With the demonetisation of Rs. 500 and Rs. 1000 notes, majority of the Indians were left with hardly any cash in their pockets, back then. He searched his cash stack - and then accepted the note I gave, and returned change. He also handed out my ticket. I was too lazy to get off the bed - I hadn't slept properly the last night. Some food item I had taken the previous night had upset my stomach. I took a very light breakfast from a restaurant nearby and headed out towards the nearest autorickshaw stand. An autorickshaw from there dropped me at CBD Belapur highway bus stop. 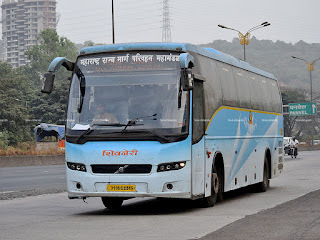 I was to board my bus to Pune from Vashi - and since the pick-up point was Vashi Highway bus stop, I decided to take an MSRTC bus from Belapur to Vashi, which would drop me at Vashi Highway bus stop. No MSRTC buses towards Vashi turned up for quite a while - it left me a little scared and worried. I checked my back-up points - the app based taxis. Availability was a little poor - but wasn't bad. An MSRTC bus turned up sometime around 0955. The ride to Vashi, through the highway generally doesn't take more than 15 minutes - and MSRTC drivers are known to be fast as well. This driver was no different, and he dropped me at Vashi highway by around 1010hrs. 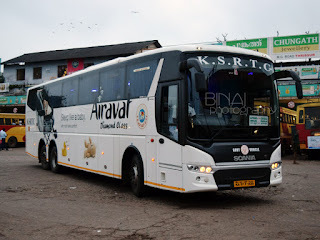 The pick-up time of my Shivneri bus was 1027hrs - I still had ample time to go. I headed to the controller's office and enquired about my bus - he looked at the ticket and said, "Bus tho ab dadar se nikla hoga" (The bus would've started from Dadar now). Thankfully, MSRTC had set up a shelter and arranged some benches for waiting passengers. There was a steady stream of departures all the time - and there seemed to be a lot of travellers as well. The first Shivneri bus to turn up after I reached there happened to be mine - the bus arrived at 1028hrs - a minute behind the advertised time! That was good - but all that due to the fact that it was a Sunday morning! The controller signalled me to get in - one more Shivneri arrived at the same time - and he had crossed checked before calling me. The driver cross-checked my seat time, and made an indication on his reservation chart before letting me in. My bus, MH-06-S-9369, of Pune Shivajinagar depot started off from Vashi at 1030hrs. The was had just over 50% occupancy - appeared normal for a Sunday since no effort was made to fill those empty seats. The driver was fast from the word go. Another passenger was occupying my seat - who did not really take it kind when I indicated that he was occupying my seat - he mumbled something and left out some grunts as he changed his seat. I settled at my seat and remained glue to the world outside. First impressions weren't good - the interiors were quite dirty and dusty. Seat back magazine holders were damaged. The curtains were good - they had used a thicker handloom variety instead of the thin ones that come from Volvo. Oh yeah - I was on board a Volvo B7R. We had another pick-up at Nerul (1035hrs). We took the flyover at Konkan Bhavan aka CBD Belapur, made a brief stop at Kharghar (1044hrs) and then hit the expressway. This was the portion I was eager about - I wanted to ride on the expressway in a Shivneri. The driver was very stable - no frequent lane changes, and absolutely no races. He remained in the middle lane for most of the time, and my phone consistently recorded speeds of 85kmph all the time. There was a traffic slowdown just before Lonavla - narrow road under one of the bridges was the reason. Traffic on the expressway seemed to be on the higher side, perhaps due to the freeze on toll collection on highways. The bus exited the expressway near Lonavla and pulled into a small food joint - at 1145hrs. 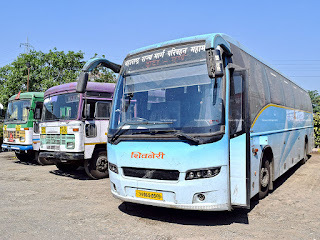 The place had only MSRTC buses - all the types, including one of those rare Ashwamedhas (Volvo Multi-axle bus). I just roamed around for sometime - purchased some chikkis (jaggery based sweets usually made with peanuts or similar dry-fruits), used the washroom and clicked pictures. My bus started off exactly at 1200hrs - a 15 minute break, exactly. I decided to use the wifi based entertainment system that was available in the bus - I selected a bollywood movie. However, for some reason, the system didn't work flawlessly like it did last time - the movie got stuck multiple times, the entire system shut down once. The first stop to drop passengers was at Bhumkar Chowk - at 1236hrs. 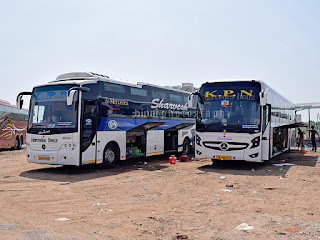 The bus kept stopping everynow and then to drop passengers after that - Wakad Chowk (1236hrs), Sanghvi Phata (1252hrs), Breman Chowk (1255hrs), University (1305hrs) and finally, Shivajinagar (1310hrs). By now the bus was more-or-less empty - hardly 5-6 passengers left now. 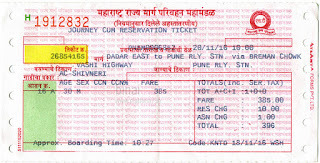 The bus finally pulled into Pune Station bus station at 1323hrs - 2 hours and 53 minutes after I started from Vashi. Remarks: The bus, MH-06-S-9369, of Pune, Shivajinagar depot had clocked about 3.02 lakh kms. 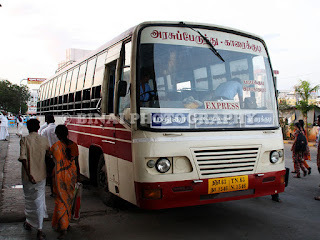 The bus appeared mechanically in good shape - no rattles were heard from the bus, except those from passenger baggage. The interiors were dirty - dusty, and probably not cleaned for some time. The magazine holders behind seats were broken. The exteriors were dirty as well. Driving was amazing - not a single rash move. Perfect stability on the highway. 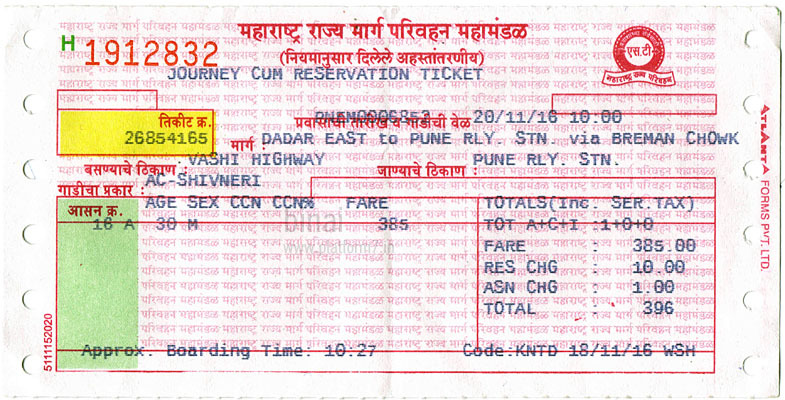 Overall, a great trip - a re-run of my first Shivneri trip, probably. Charging Point: Available, Did not check if it worked. Entertainment: Available - WiFi based. Will I take this service again? They are the best option if you wish to travel from Mumbai to Pune. They may be a little expensive compared to private operators, but they are punctual and worth the money.